And we're a' noddin' At our house at hame. May be to meet nae mair. Noo we're a' noddin', etc. My comfort was their smile ! We'd may be meet again. And bursted out and grat. At our house at hame. NAE LUCK ABOUT THE HOUSE. 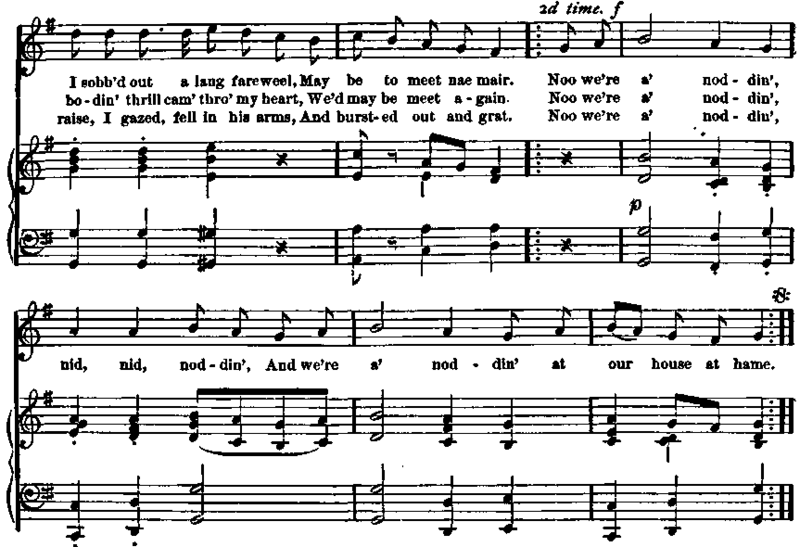 The authorship of this exquisite Scottish song has long been a subject of dispute. Conflicting claims are urged by the friends of William Julius Mickle, and Jean Adam. Mickle's claim rests upon the affirmation by Rev. John Sim, editor of Mickle's works, that Mrs. Mickle perfectly recollected her husband's giving her the ballad as his own production, and explaning to her English ears the unfamiliar Scottish words and phrases. Jean Adam's title to the honor is upheld principally by the statement of Mrs. Fullerton, a pupil of Miss Adam's, who had many times heard her repeat it, and distinctly claim the authorship.